Yowza! Into day 5 of my personal experience with the Pig Flu. Very not fun. Very. On the upside-I shouldn’t need the vaccine now. Which, it would appear, is a good thing; ’cause there ain’t none. BARRE – Dozens of central Vermonters were turned away from an H1N1 flu vaccination clinic Saturday morning after health-care workers quickly ran through the 500 doses they had on hand. By 8 a.m. – an hour before the clinic was supposed to begin – a queue of flu-wary residents braced against a cold and persistent November drizzle outside the Barre Auditorium. By 10:30, an hour and a half before the clinic was scheduled to end, nurses closed the doors. Vaccinations at Saturday’s clinic were reserved for people in “priority groups” who, by virtue of age or medical condition, are more prone to serious complications if they contract the virus, commonly known as swine flu. 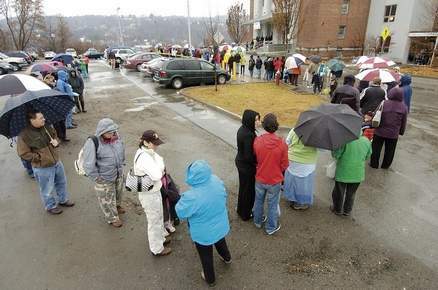 a queue of flu-wary residents braced against a cold and persistent November drizzle outside the Barre Auditorium. Doesn't this look like your last trip to the grocery store? I trek 25 miles from Rockville to the Fairfax store every month or so because it offers so much. First, there’s the Market Cafe for lunch, then the Wine Cellar to stock up on our favorites. Then we spend probably an hour strolling through the store, buying the best and most varied produce I’ve ever seen, meats that are packaged to last more than a day or two, and all those odd products I can’t find elsewhere. When we check out, not only is the cashier the most pleasant anywhere, but the grand total is competitive with other local stores. Crazy free market! Trying to profit by selling FOOD! Everyone has a right to food! This entry was posted in Economics, Health Care and tagged Health Care, Liberal, North Carolina, Politics. Bookmark the permalink.